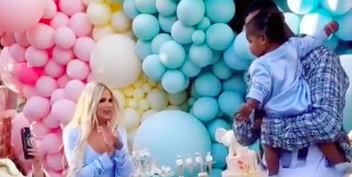 While the rest of us were gearing up for the season premiere of Game of Thrones yesterday, Khloé Kardashian was busy celebrating at her daughter True Thompson’s first birthday party. And at this point you’re probably wondering if Tristan “Third Trimester” Thompson showed up for the event. Tristan could be seen standing next to Khloé in a video posted to her Instagram, and I’m happy to report that she appears to be basically ignore everything about his presence next to her—instead focusing on True, the camera, and a family friend. L-O-L at this justifiably shady behavior. A true “wait sorry, who are you?” moment if there ever was one. By the way, it’s not that shocking that Tristan was invited to Khloé’s party. A source previously said that “She’s very good at compartmentalizing, and at the end of the day, she wants True to have a happy relationship with both of her parents. She’s not one to seek revenge or hold on to negativity.” Cool-cool-cool, though another source said that Kim Kardashian apparently thinks there’s no way Khloé can “keep it together and not lose it on him,” so….